​Guy Withers is a light-lyric tenor from Bristol studying with Ryland Davies. A Cardiff University Music graduate (BMus hons. ), Guy was awarded The Cardiff University Vocal Scholarship, The David Lloyd Prize for Singing and The Elizabeth Griffiths Prize. He has performed in masterclasses under Robin Tritschler and Isobel Buchanan, and in addition has received tuition from John Hugh Thomas, Miriam Bowen, Ian Partridge, John Graham-Hall and conductor Stephen Higgins at ENO. 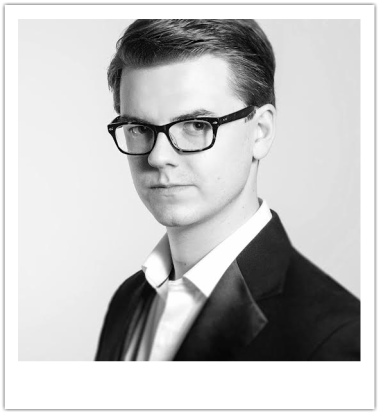 Since 2015 Guy has been working in The Opera Holland Park Chorus (Aida 2015), and most recently performed in a new piece for The Theatre Royal Bath/Dance umbrella. He additionally has sung around the UK with Bristol Opera, Tessitoura Opera, White Horse Opera, Opera’r Ddraig, Opera South, Opera Lyrica, Aylesbury Opera Group, Opera Anywhere, Guildford Opera Company, and The Ryedale Festival Opera. Principal roles include: Albert Herring (Albert Herring), Prologue/Quint (The Turn of the Screw), Ferrando (Cosi Fan Tutte), Tamino (The Magic Flute), Don Ottavio (Don Giovanni), Basilio (The Marriage of Figaro), Sailor & Aeneas (Dido & Aeneas), Edmondo & Lamplighter (Manon Lescaut), M. Triquet (Eugene Onegin), Jaquino (Fidelio), Spalanzani (The Tales of Hoffmann), Schoolmaster (The Cunning Little Vixen), Panatellas (La Perichole), Nanki-Poo (Mikado), Frederic (Pirates of Penzance), Gastone (La Traviata), Sellem (The Rake's Progress), Steersman (The Flying Dutchman) and Cascada & Camille (cover) (The Merry Widow).